You would be mistaken to think that a ‘serger’ is just a cool new naming scheme for Brother’s sewing machines. On the contrary, it’s an entirely different class of machines intended for creating professional-grade seams, ones that are durable no matter the type of fabric used, and especially for the more tricky stretchy fabrics. In fact, you can consider a serger to be a significant upgrade compared to your regular sewing machine, one that you won’t be able to do without, once you experience the next level sewing you can achieve with a serger sewing machine. As you can see, Brother 1034D has 4 ‘masts’ for threads, or differential feeds, with which you will be able to craft the most demanding and durable clothing. Bought in a store, such clothing would cost you an arm and a leg, but with eminently affordable Brother Serger 1034D, nothing will stop you from creating professionally made clothing for a fraction of the price! Let’s take a look at the full package. 1.2 Does Professional Equal Difficult? Impressive speed at 1300 SPM (stitches per minute). Differential thread feeds can be overlocked in 3 or 4 threads, hence the signifier ¾. 5mm – 7mm adjustable stitch. Can take needles from 11 to 14 size. Retractable knife blade for trimming the edges. It can be disabled, but you will find using it more than not. An extremely useful feature. 25-year limited warranty, which is standard for the industry. Soft cover (you should make an extra expenditure and get yourself a hard cover, making the 1034D by Brother easier for transport, and safeguarding it while not in use). Foot controller with a gathering foot and a multi-purpose guide foot. Set of needles to get you started. 4 spool nets for the 4 differential feeds. Bag for all the accessories. Manual and a video instruction manual on a CD. But don’t worry, if you no longer have a CD player, just do a quick Youtube search. 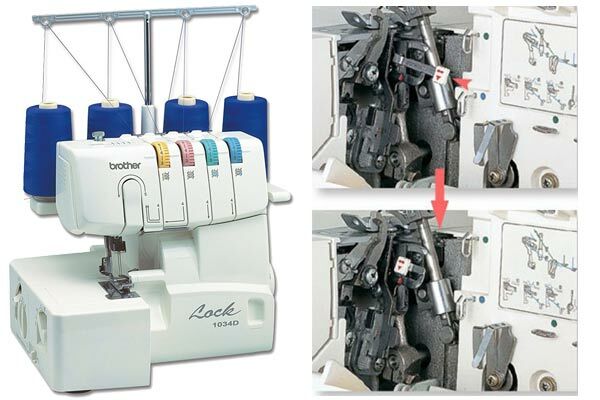 There is a comprehensive range of tips – from beginners to serger veterans. Make no mistake, using 4 differential feeds is a new sewing process that has to be learned, but once you get it right a couple of times you will wonder how on earth did you ever thought that this would be difficult! So no, Brother 1034D does give you professional results, but it is no more difficult than operating a regular sewing machine. You just have extra options! In fact, it is one of the top sewing machines for dressmaking you can get (see here)! As you have gathered from the pictures of the machine, there are 4 color-coded threading with robust dials and diagrams. The included guide will tell you exactly, in a step-by-step process, how and where to feed each of the available threads. Be patient and take it gradually to avoid any frustration. In no time (within half a day) you will be able to master all the steps necessary for utilizing all 4 thread lines. We’ve praised the serger enough already, but what can you actually do with one, especially with the 1034D that has a range of 22 stitches? Decorative edges, ruffles, tight sleeves for pants and shirts, gathers, laces, spaghetti straps, rolled hems, ribbon lock stitches, and many more. In short, the sewing versatility that this serger machine gives you is huge – from home décor, heirlooms, bridal wear, formal wear, to denim and jeans. Most importantly, you will no longer have headaches when working on tricky fabrics that easily crumple and stretch. Every single time, differential feeding system will allow you to create a professional finish. Of course, if you have learned the serger process first. Superior speed which can be rarely encountered with even machines that cost 3 times as much. Exceedingly easy to use as a serger, thanks to color-coded dials and diagrams. Definitely 1034D is a serger suitable for beginners who want to advance to the next level. Very affordable. It will be quite difficult to find a powerful serger for this price. Consistent thread tension can be easily adjusted. Lack of chain-stitching and coverlock stitching. Although it can do tough fabrics like leather and denim, combining multiple layers may not be advisable. However, that can be said for many sewing machines, unless sewing through multiple layers is not specifically mentioned as a feature of the machine. A bit on the noisy side of things, especially when you ramp it up. An additional muffling would have yielded a more comfortable experience. If you factor in the low price tag, without a doubt, the 1034D is an excellent option for anyone who wants a well-rounded sewing machine that is also a serger. After all, once you go serger, you can never go back, as serging allows you to deal easily with delicate fabrics. And not just deal with them, but finish exceptional seams that are not equally achievable with regular sewing machines. In the end, Brother 1034D Serger has the ‘Amazon’s Choice’ moniker and it is a well-deserved one. It is exceptionally powerful, affordable, easy to use and control, it can be used for any kind of fabric crafting – from décor and clothes to curtains – and the retractable knife feature is something you will use on a regular basis. When combined all together, it is currently impossible to find a better balance of features and price, which is more than enough to recommend it as your go-to serger for many years to come!